Aims. We study the variation in the magnetic field strength, area, and continuum intensity of umbrae in solar cycles 23 and 24. Conclusions. The umbral brightness decreases in the rising stage of a solar cycle, but increases from maximum toward the end of the cycle. Our results do not indicate a drastic change of the solar cycle toward a grand minimum in the near future. Specifically disagrees with Livingson et.al. concluding the weak trending lower is too minor for there to be much change on the horizon. Methods. We analyzed a sample of 374 sunspots observed from 1999 until 2014 with the Tenerife Infrared Polarimeter at the German Vacuum Tower Telescope and the Facility InfRared Spectropolarimeter at the Dunn Solar Telescope. The sample of field strength, area, and intensities was used to trace any long-term or cyclic trend of umbral properties in the last 15 years. Results. Sunspots are systematically weaker, that is, have a weaker field strength and stronger continuum intensity, toward the end of cycle 23 than they had at the maximum of cycle 23. The linear trend reverses with the onset of cycle 24. We find that the field strength decreases in the declining phase of cycle 23 by about 112 (± 16) G yr-1, while it increases in the rising phase of cycle 24 by about 138 (± 72) G yr-1. The umbral intensity shows the opposite trend: the intensity increases with a rate of 0.7 (± 0.3)% of Ic yr-1 toward the end of cycle 23 and decreases with a rate of 3.8 (± 1.5)% of Ic yr-1 toward the maximum of cycle 24. The distribution of the umbral maximum field strength in cycle 24 is similar to that of cycle 23, but is slightly shifted toward lower values by about 80 G, corresponding to a possible long-term gradient in umbral field strength of about 7 ± 4 G yr-1. If instead of the maximum umbral field we consider the average value over the entire umbra, the distribution shifts by about 44 Gauss. I suspect that won’t go down well in all circles, edge science is always on the brink with nothing really clear. As usual the most likely with any newly discovered effect is no change whereas history is littered with panics after discovery and so on. Duh. We just had a grand solar maximum. Why are they looking for another back to back. From what I have seen recently, last decade, is Livingson et.al. are always wrong. That picture from Solar Cycle 23 is now 14 years old. 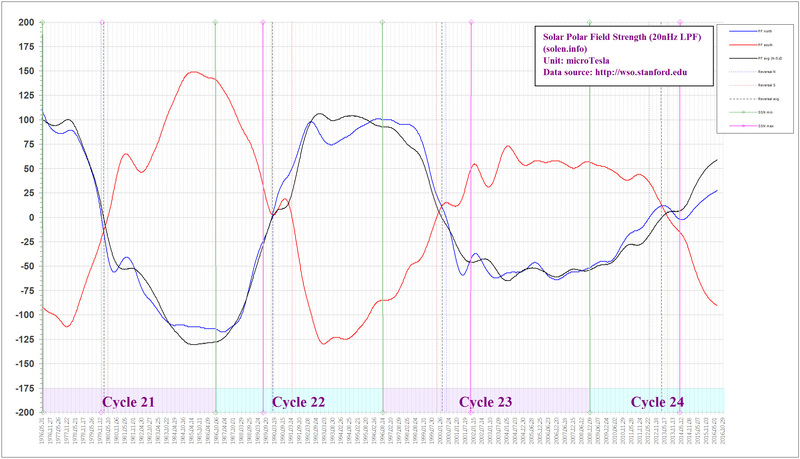 Anybody seen anything like this during the present Solar Cycle 24? 1. Cycle 24: It ain’t over til the fat lady sings. How can authors consider “the average value over the entire umbra” before 24 is complete? 2. “Our results do not indicate a drastic change of the solar cycle toward a grand minimum in the near future.” It would have been more accurate to add “as a result of magnetic field strength”. I do realize that in the context of the paper that this statement is technically correct, but it seems that this omission indicates an advocacy position. The obviously knowledgeable authors surely realize that historically, magnetic flux has had a significant influence, but not always. It’s hiding on the other side. The sun’s axial tilt is 7.25°. It’ll be back in view in 10-14 days. Richard111 – not even close! SC24 has been very tame by comparison. Look the latest update (umbral magnetic field). I think that this paper is insignificant. The paper means nothing because no one can really predict what solar activity may or may not be going forward. That is why I just respond to the data and not theories which are all over the place and a dime a dozen. The solar polar field strength in 2020 will be the definitive guide to SC25’s amplitude. As of earlier this year, solar photospheric synoptic maps barely had any sign of the plasma jetstream organized at higher solar latitudes that is the source of the next cycles’ active regions, as compared to the previous cycles at this point in the respective cycle. Meaning SC25 will be weak. How weak? ??? “Latitude-time plots of jet streams under the Sun’s surface show the surprising shutdown of the solar cycle mechanism.” Arrow in upper right corner is where new jetstream should be. I’m looking for an updated image, so far no luck. Neutrons perfectly show what is happening with the magnetic field of the Sun, because react to the solar wind. “The solar magnetic activity band interaction and instabilities that shape quasi-periodic variability” http://www.nature.com/ncomms/2015/150407/ncomms7491/pdf/ncomms7491.pdf. I read the paper as unusually critical in print of other authors, making methodological criticism. This is a highly specialised field so I can’t even start to comment. A question is whether there will be a response from those criticised, if so where will this appear? I think as is so typical of science the data is not self evident. Among many other measurable quantities, the summer of 2009 saw a considerable low in the radiative output of the Sun that was temporally coincident with the largest cosmic-ray flux ever measured at 1 AU. Combining measurements and observations made by the Solar and Heliospheric Observatory (SOHO) and Solar Dynamics Observatory (SDO) spacecraft we begin to explore the complexities of the descending phase of solar cycle 23, through the 2009 minimum into the ascending phase of solar cycle 24. A hemispheric asymmetry in magnetic activity is clearly observed and its evolution monitored and the resulting (prolonged) magnetic imbalance must have had a considerable impact on the structure and energetics of the heliosphere. 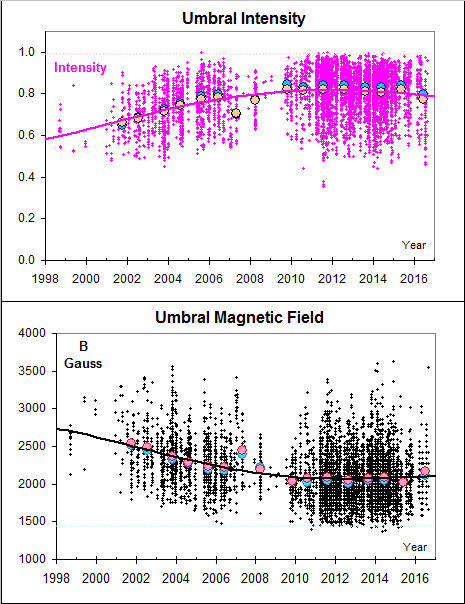 While we cannot uniquely tie the variance and scale of the surface magnetism to the dwindling radiative and particulate output of the star, or the increased cosmic-ray flux through the 2009 minimum, the timing of the decline and rapid recovery in early 2010 would appear to inextricably link them. These observations support a picture where the Sun’s hemispheres are significantly out of phase with each other. Studying historical sunspot records with this picture in mind shows that the northern hemisphere has been leading since the middle of the last century and that the hemispheric “dominance” has changed twice in the past 130 years. The observations presented give clear cause for concern, especially with respect to our present understanding of the processes that produce the surface magnetism in the (hidden) solar interior—hemispheric asymmetry is the normal state—the strong symmetry shown in 1996 was abnormal. Further, these observations show that the mechanism(s) which create and transport the magnetic flux are slowly changing with time and, it appears, with only loose coupling across the equator such that those asymmetries can persist for a considerable time. As the current asymmetry persists and the basal energetics of the system continue to dwindle we anticipate new radiative and particulate lows coupled with increased cosmic-ray fluxes heading into the next solar minimum. The Earth is bathed in a flux of energetic particles originating from the Sun and outside of our heliosphere, called cosmic rays. While the smallest component of CRF, also consisting of the lowest energy particles, originates in energetic solar phenomena such as flares and coronal mass ejections, the majority arise in cataclysmic events outside the heliosphere that penetrate the solar system and eventually reach Earth (Gaisser 2001). Indeed, cosmic rays constitute a non-negligible fraction of the annual radiation dosage of humans (Schwadron et al. 2010), pose a considerable threat to the well being of astronauts during space flights (e.g., Mewaldt et al. 2005), and have an impact on aircraft avionics and airborne computer systems (Taber & Normand 1993; Ziegler & Srinivasan 1996). As potential lightning onset triggers (Gurevich et al. 1999) and as cloud nucleation seed particles (e.g., Svensmark & Friis-Christensen 1997), cosmic rays can even be considered to be relevant to terrestrial climate. Fortunately, the Earth is protected from the CRF by the action of its magnetic field as well as that of the Sun. When a cosmic ray hits the atmosphere, it produces secondary particles including neutrons. These neutrons pass through the atmosphere, through whatever building the neutron monitor is housed in, and penetrate the detector. In a neutron monitor, neutron-sensitive proportional tubes filled with either 10BF3 or 3He gas, surrounded by moderator material (typically polyethylene, to reduce the energy of the secondary cosmic-ray particle to about 0.025 eV) and a lead target, detect near-thermal neutrons produced locally from interacting incident particles. A tube filled with either 10BF3 or 3He gas responds to neutrons through the exothermic reactions 10B(n, α) – 7Li, or 3He(n, p) – 3H. So even though neutrons do not leave an ion trail in the proportional tube, the energetic ions result from absorption of a neutron by a nucleus strip electrons from neutral atoms in the tube, producing a charge, which is detected as one count. Thousands of counts per hour are detected. Why can no one post anything in opposition to the TB mantra nowadays, in a thread such as this? Please give us all the opportunity to choose of the scientific versus the political. I have no argument with your political. This is simply dross! My young kitten has precise sharpened claws and much willing to defend her POV, else she will eat your face off.